The Colne Valley Railway was opened in 1860 to run from Chappel to Halstead. Over the next few years the line was extended to Castle Hedingham and on to Haverhill in Suffolk. The line was one of those that was closed in the 1960's. Like all similar enterprises many of the staff joined the services at the start of World War One of which five were killed during their service. Those who fell include two members of the Essex Regiment. 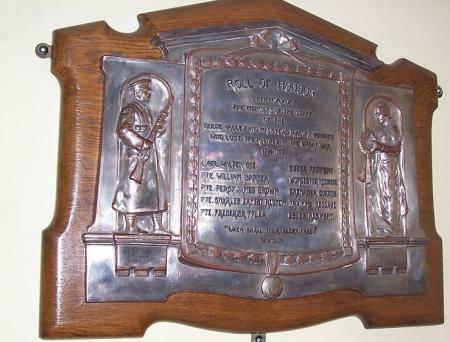 A memorial was erected in the waiting room of Chappel Railway Station which is now better known as the East Anglian Railway Museum at Chappel. Since the memorial was commissioned there have been several changes of management in the railways and the Colne Valley Railway is no more. The memorial has a permanent home on display at the East Anglian Railway Museum at Wakes Colne, Essex which is apt as the railway museum uses part of the old railway line.